The main door faces South West and is regarded as the orientation of the house as a whole. The house is `divided' into eight sectors. Each sector has a good or bad location. 1. This is a sterling example of "don't just follow blindly". 2. Once a while we were asked why our resource on this link is different from some other websites. 3. Just because one happen to visit one or more sites and they differ from our view-point, does not automatically make theirs absolutely correct and ours wrong. 4. In Feng Shui and many other fields, there can be differences in opinions. More importantly, it is best to understand the rationale for the differences. 5. So why does Geomancy.net not simply follow others? a. Two kinds of Feng Shui exists: Yang (for the living) and Yin (for the dead). b. The application of Flow of Qi. 8. In Yin Feng Shui, good qi is preferred at the Sitting position vs the Facing direction. 8.1. 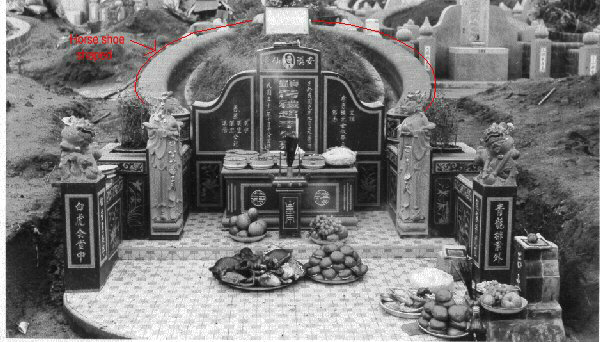 In the example, below: under Yin Feng Shui; A traditional grave-site has a Horse-shoe design. 8.3. 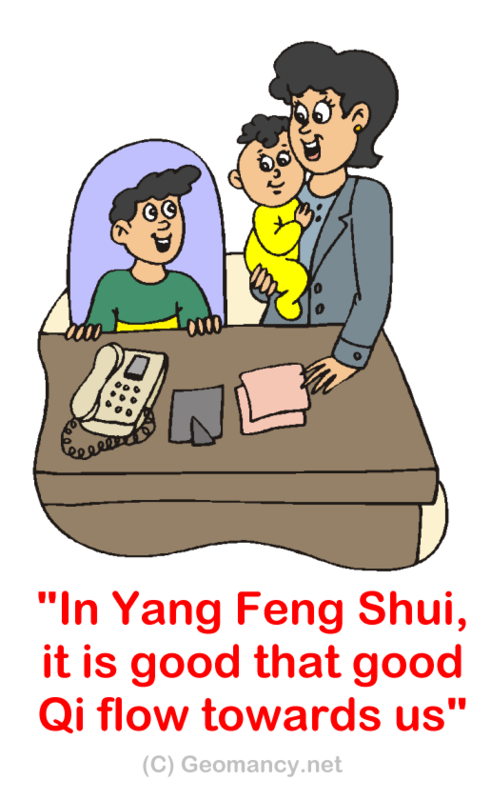 Thus for Yin Feng Shui, this is where you want to have lots of good Qi behind you so as to ward of the Bad Qi. 9. Most chart today, is replicated from this Yin Feng Shui concept. 10. We have thus opted for the more important Qi Flow direction. 10.2 For the dead, they would otherwise be lying on the ground horizontally with their head at the tip of "Horse-shoe" and their legs facing the Frontage of the grave site. Do you see the difference, here? 11. 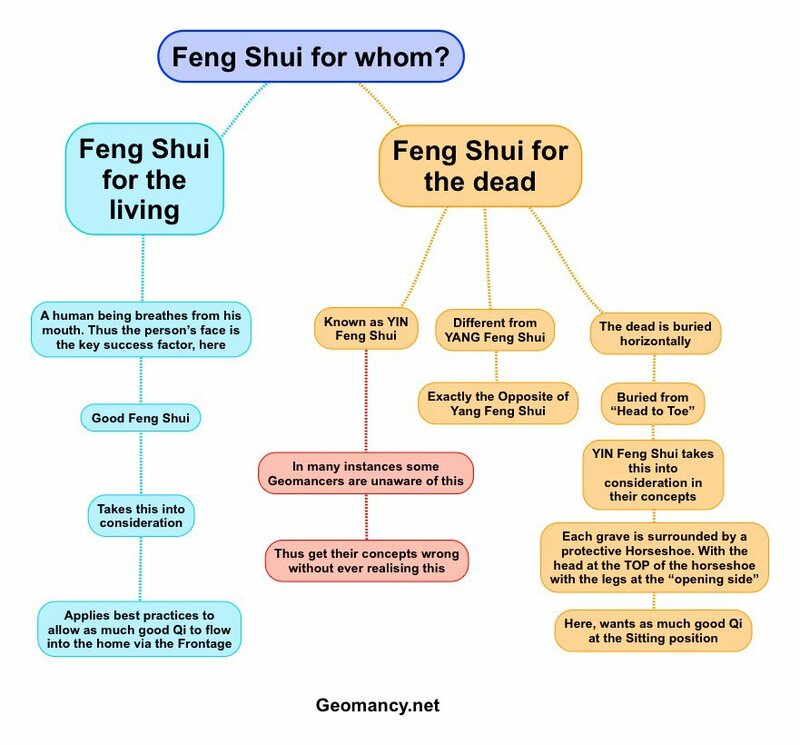 This is the rationale why Geomancy.net adopted the above layout to better reflect Yang Feng Shui concepts. 12. Thus, our charting is no accident nor a mistake. 13. In real-life, we cannot just follow blindly. This is why it is good to have differences of opinion. 14. And what makes one think that just because everyone else does the same, and if someone else does it differently, they must be incorrect. 14.1 Here for all you know, it could instead be like "The rose amongst the thorns" LOL!